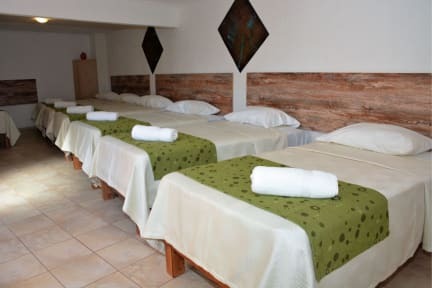 Valle Mistral offers WiFi throughout the establishment, cable TV in every private room, maid and breakfast service for all our guests, sheets and towels included in our privates rooms and sheets included in our shared dorms, every room has their own private bathroom. We have great common areas where all our guests can enjoy and share with others guests. Our establishment is an eco-friendly place, our energy is provided by solar and photovoltaic panels; we are members of the Ecosustentables.cl Directory of EcoEmpresas of Chile. Valle Mistral has an environmental, cultural and social commitment with our community. Valle Mistral is in the best position in the area, just 50mts to the bus stop to Coquimbo and Valle de Elqui. Pretty closed to Terminal de Buses, and principal avenues of La Serena. We have 5 types of rooms, we have a dorm with 7 beds, rooms for 1 guests with a double bed, rooms for 2 guests with a double bed, rooms for 2 guests with twin beds, and familiar rooms, all of them have private bathroom with hot shower. 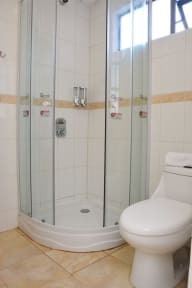 Towels and sheets included in our privates rooms. Sheets included in our dorm rooms. Breakfast and maid service every day. Cable TV in every room. The smallest room is 25mts square. Taxes not included - 19.00%. No, Chileans or foreigners with permanent residence must pay 19% on VAT. Foreign tourists are exempt from the 19% value added tax.